GeoBlue BASIC Upgrade | Optional BASIC Coverage for Inbound Trips to U.S. Recently GeoBlue announced the introduction of their BASIC Upgrade option. This option was an answer to a problem that has existed for quite a while. GeoBlue offers three versions of their Xplorer for Expats plan and up til now the only option one had for coverage while visiting the United States was their Flagship plan the Xplorer Premier. However the Premier was designed for those who not only live abroad but spend part of each year also at home in the United States or her territories. The introduction of the BASIC option now provides for a cost-effective way to provide coverage for those who currently live abroad but still may have need for coverage during short-term visits home. Prior to the Basic Option if a GeoBlue member was living abroad without the U.S. Coverage option for the plan selected then any inbound trips to the U.S. went uninsured or they had to purchase a separate Travel Medical plan for that one inbound visit. This post shares the comparison chart below showing the primary differences between the Flagship Xplorer Premier (includes U.S. Cover) and the Xplorer Essential (No U.S. Cover) with the BASIC upgrade option selected. This new optional upgrade solves a problem we have all had to accept until now. The Basic Upgrade is a new tool for those who are living or planning to live abroad but do not have the need for comprehensive U.S. Coverage. When you select an health plan for living abroad GeoBlue offers two primary options, one the Premier Plan includes coverage over the entire globe including the United States and her territories. Or secondly you can select the Essential plan which provide global coverage minus the United States and her territories. With the BASIC Upgrade option you can now visit home here in the states without the high cost of the Premier plan or the added headache of obtaining a separate inbound travel medical plan when you decide to come home a visit for a few weeks. Simple add this upgrade at the time of application or if you are already an Essential plan member add it at the time your plan renews for the upcoming year. Coverage Area Inside the U.S Inside the U.S. 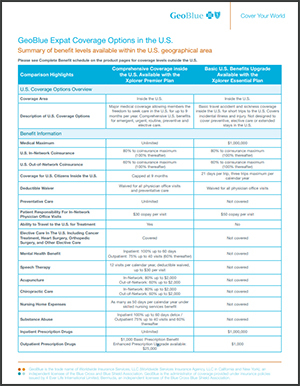 Description of U.S. Coverage Options Major medical coverage allowing members freedom to seek care in the U.S. for up to 9 months per year. Comprehensive U.S. benefits for emergent, urgent, routine, preventive and elective care. Basic travel accident and sickness coverage inside the U.S. for short trips to the U.S. Covers incidental illness and injury. Not designed to cover preventive, elective care or extended stays in the U.S.
Pre-existing Condition Exclusion Period 180 days Exclusion waived with evidence of prior health insurance 180 days Any evidence of prior health insurance does not apply to pre-existing condition wait period.